If you’re going to showcase your manners, there really is no better time to do so then when you sit down to a meal with others. There’s definitely more to dining etiquette than meets the eye, and one of the main goals to aim for is leaving others with a good impression of you and having them look forward to the next stage of the relationship. Not every meal is held or attended with the same intention. In fact, if you’re not entirely sure why this meal is even happening in the first place, you’re already at a disadvantage. Set the course from the start. Is it going to be a social bonding time with a prospect? If not, does it fall under the nuance of a serious talk hammering out the details of a business deal? You’re not going back to chill in front of the TV or with your phone. Remember that this is just an extension of your workday, so it’ll be a mash-up between networking and a business meeting. Get comfortable in order to put others at the table at ease, but don’t forget just why you’re there and what specific outcomes you’ll like to see from the meal. It’s going to be pretty awkward and off-putting if your stomach starts growling at the table. Avoid that scenario by eating a little in advance so you’ll be able to concentrate on the conversation, not the plate in front of you. 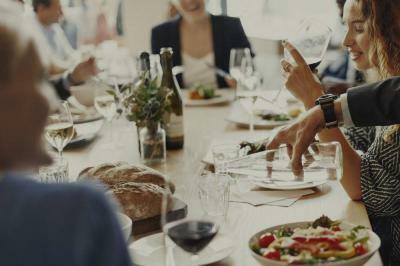 Also, avoid messy foods such as pasta, crab legs or ribs that will make it harder to focus on the people at your table. In today’s hurried and busy world, it’s becoming a common sight to see people eating by themselves. However, a business dinner requires a lot more interaction, so you’ll want to bring your networking skills to the fore. Be prepared to talk about all kinds of general topics ranging from the food in the restaurant, sports and current news. You’ll also want to be genuinely interested in knowing more about others, so prepare a few questions to ask beforehand. You can tell a lot by someone’s body language, and it’s usually used to assess many aspects of a person. During the business dinner, remember to pay attention by sitting up straight and looking at the person you’re talking or listening to. You’ll also want to bring forth other table manners such as chewing with your mouth closed, knowing which fork and spoon to use, and also not talking with your mouth full. At 654LIMO, our commitment to provide business travelers with a first-class experience. We are more than happy to provides our valued clients with the best limo service Destin FL has to offer. We offer you customized transportation solutions to meet any special requests you and your group may have.